Chairman of the Yanggang WPK Provincial Committee RI Sang Won presides over a meeting marking the 60th anniversary of study tours at revolutionary battle sites in Samjiyo’n (Photo: Korean Central TV). Ri Sang Won (Ri Sang-wo’n) is the Chairman of the Yanggang (Ryanggang) Workers’ Party of Korea [WPK] Provincial Committee and a member of the WPK Central Committee. Ri is a deputy (delegate) to the 13th Supreme People’s Assembly [SPA]. Ri is a former local guidance official and instructor of the WPK Organization Guidance Department. His first significant position was the chief secretary of the Chunghwa County from 2004 to 2006. At that time, Chunghwa one of Pyongyang’s suburban counties and presently part of North Hwanghae Province. Ri Sang Won attended a short course at Kim Il Sung Higher Party School during early 2007 and worked in the central party. In August 2007 Ri Sang Won was appointed chief secretary of the Kaeso’ng WPK City Committee. He held this position until October 2013. In November 2013 Ri was appointed chief secretary, now chairman, of the Yanggang WPK Provincial Committee becoming the party’s leading official in the province. 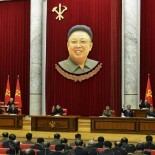 He replaced party elder Kim Hi Taek, a former senior deputy director of the WPK Organization Guidance Department. Ri was elected a deputy (delegate) to the 13th SPA. During the 7th Party Congress in May 2016, Ri was elected a member of the WPK Central Committee.